The technology revolution is also a data revolution! In less than ten years there has been an explosion of new mobile devices, which has increased everyone’s capacity to consume data on the go. This new technology is also increasing the demand for Environment Agency data to fuel new products and helps us to protect people and wildlife. Technology plays its part in getting our data and messages to partners and the public who need to prepare for, and respond to, flood events. For example, making our live flood warnings available as APIs represented a significant technological advance for us because it ensures that our messages are available to people quickly, in an accessible format to allow them to take action. Use of APIs is one technology route we will follow in the coming years because it provides a single source of truth to all users, is easier to manage than delivering data via memory sticks or DVDs, and it makes data available immediately. Similarly, we’ll try to make datasets available as linked data, Web Map or Web Feature Services where we can. We have begun adapting to these developments by beginning to provide our data as open data. There are already different ways that our users display our data. Our aim is to see our data become incorporated into other services, eg combining location, road, and other transport information with our flood data and real-time data sourced from those who respond to floods , including our own officers, emergency services and local authorities. This could mean that driving routes could be updated in real time to avoid areas where flood warnings are in force. In May last year we committed to our approach being ‘open by default’ and have been releasing large amounts of data as open data over the last year. We are interested in increasing the reach of our information to more people, as well as promoting how other organisations can use it improve the situation for both people and wildlife. By increasing the amount of open data we release, we give businesses and the public the opportunity to exploit the information we create via multiple channels. 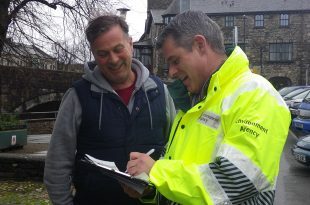 This is particularly important as we need those at risk of flooding to know and act on this information with as much warning as possible, and those tasked with responding – including EA officers – to have the best information we can provide. With the increasing availability of data created by communities about their local environment, we could see the integration of more crowd-sourced data, – such as the actual number and location of houses and roads flooded – into our technology to help us make decisions based on the best possible information. We anticipate our increased use of the ‘internet of things’, where we can make use of inert structures not primarily designed for flood response by attaching sensors. Access to trustworthy, up-to-date and machine-readable data lies at the heart of our work. In the future, we are just as likely to rely on community and third party data as on our own. Technology exists to manipulate the data we have: innovation from the private and public sector will unlock its potential.